Yellow-bellied marmots (Marmota flaviventris) are one of the largest members of the “squirrel” family of rodents. They can be two feet long and weigh up to eleven pounds and can live singly or in colonies of up to twenty individuals. They are abundant in the high meadows and rocky slopes of the mountains of the western United States and southwestern Canada. Some years back, when we were hiking in Rocky Mountain National Park, we saw yellow-bellied marmots at almost every turn of the trail. In fact, they converged on us whenever we stopped for a water or snack break. I remember one of the marmots being fascinated with some dangling threads on the cuffs of Deborah’s jeans (the marmot did her best to chew the treads free) and others who tried to climb into our packs to get at our crackers and bags of peanuts and M and M’s. They were numerous and persistent! The marmots we encountered apparently lived in colonial groups along the well-used trails of the park. They were obviously very accustomed to augmenting their plant based diet with anything they could glean from passing hikers. Such an optimal habitat could support a large number of marmots, and we never saw any marmot-on-marmot antagonistic behaviors even their frenzy for the occasionally dropped M and M.
Yellow-bellied marmots have built-in behavior patterns that help them to keep their population densities from exceeding the quality of their resource bases. Yearlings (right after their long (often eight months!) hibernation) leave the protection of their birth colony and set off to establish themselves in some unoccupied habitats. All male yearlings are dispersed in this way and about half of the females. The quality and quantity of food resources plays a role in exactly how many females are permitted to stay close to the birth burrow. The mortality figures for these young marmots are extreme: only half of the original birth cohort survived to one year of age, and the consequence of this yearling dispersal is a very high rate of predation (primarily by coyotes, black bears, badgers, American martens and golden eagles). Being a young marmot is not for the weak of heart! At reproductive maturity (2 years of age) males will establish and protect a burrow with up to four females. 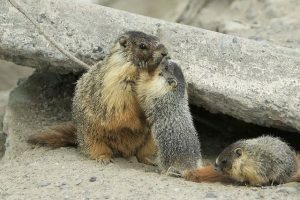 There can be up to twenty marmots living in very closely connected home burrows in an optimal habitat. 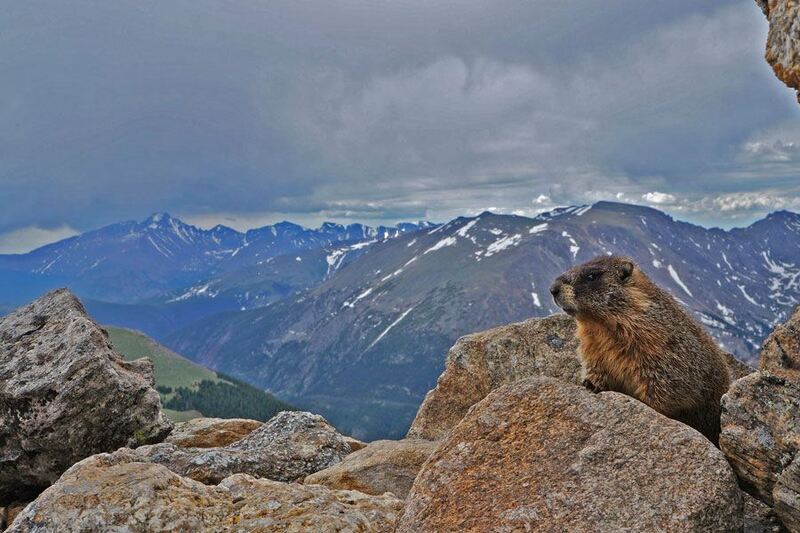 These marmots display varying degrees of amicable social behaviors (social grooming, play, greeting behaviors) and, occasionally some aggressive, agonistic behaviors (dominance grooming, mounting, and even fighting). Yellow-bellied marmots, then, have a very facultative approach to living in social groups. There are a lot of advantages to living in a group. There are more eyes available to watch for predators, and each individual spends less of their own time on guard and more time on feeding or resting. Food resources can be more efficiently located and care of the young can be shared among the group. For many social animals, the loss of these group benefits can be devastating. Humans, baboons, macaques, dolphins and sheep all show terrible individual wear and tear when individuals live without a supportive society around them (for humans, living without social contacts is as serious a negative health factor as smoking a pack of cigarettes a day!). It is surprising, then, to find that yellow-bellied marmots actually live longer when they live solitary, less social lives. years is a very significant reduction! 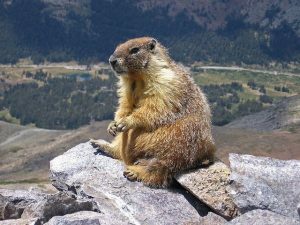 Blumstein speculates that close social interactions may facilitate the spread of disease or may distract the marmots from their watchfulness for predators. 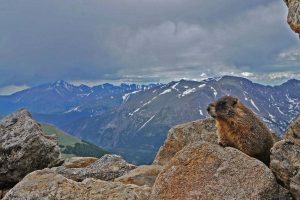 The long hibernation period of these marmots is also a time of high mortality and group hibernation may lead to inappropriate wakefulness and, thus, an increased risk of starvation during the long mountain winters. We are planning to go back to Rocky Mountain National Park this summer. 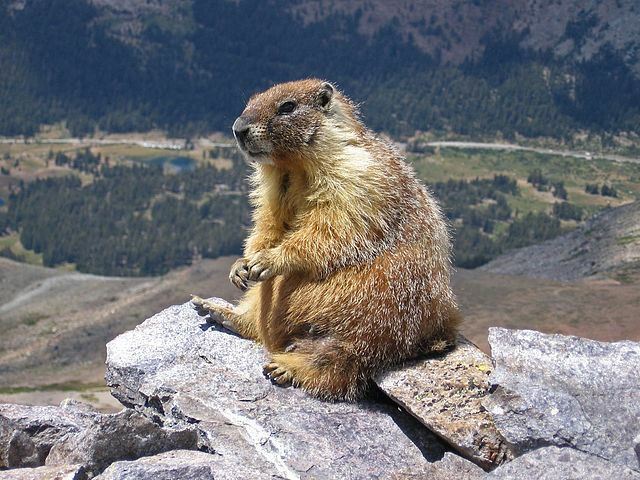 I intend to keep a close eye on the yellow-bellied marmots (not only to make sure they stay away from my M and M’s!). Deborah and I saw our first bat of the spring the other night. Where we once had dozens of bats circling over our house and field, this year we have only seen this one individual. The impact of white-nose syndrome has been devastating on the bat species in our area. Populations of our four major bat species have declined by 75% due to this infection! White-nose syndrome is caused by a fungus (Pseudogymnoscus destructans) that was introduced from Europe in 2006. Infected individuals wake up inappropriately during hibernation and end up starving because of excessive body energy expenditures. The bad news is that the fungus that causes white-nose syndrome has just been found in bat caves in northern Texas. Texas has a rich and diverse bat fauna. Thirty-two species of bats are found in the state! The spread of white-nose into this region could be devastating. To add to the sadness and futility of this situation, it is thought that people by ignoring warnings and by not taking precautions against the contact with and transmission of this fungus, are responsible for the spread of the fungus into these western states. I’ll have more updates about our bats as the summer goes on! 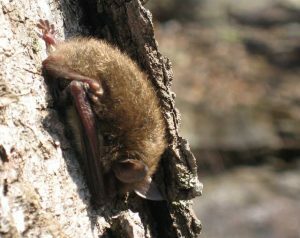 One Response to Signs of Spring 12: Yellow-Bellied Marmots and an Update on Bats! Found a tick crawling up my neck the other day. Looked like a black leg, but I crushed it before a completely positive ID.